Abstract In the first experiment, 40 Boer (B) and 40 Spanish (S) does were used to evaluate effects of treatments in the interval (IT) between periods of a Latin square design on behavior when exposed to fences with barbed wire strands for cattle and added electric fence strands for goats. The desire was to determine if an IT would eliminate period or carryover effects so that a Latin square could be used for consistent and accurate evaluation of different electric fence strand treatments. Breeds were split into two sets with five groups of four does. Evaluation pens (5; 2.4 × 3.7 m) had one side of barbed wire strands at 30, 56, 81, 107, and 132 cm from the ground. Fence treatments (FT) were electrified strands (6.0 kV) at 15 and 43 (LowHigh), 15 and 23 (LowMed), 15 (Low), 23 (Med), and 43 cm (High). Behavior was assessed once every 2 wk with different FT in the five periods of a 5 × 5 Latin square experiment. In the week between measurements, one set of each breed was exposed to a pen with no electric strands as IT-Yes and other sets were not (IT-No). 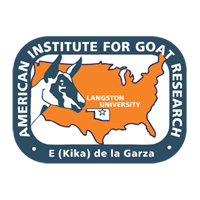 There were interactions (P < 0.05) in the percentage of goats exiting pens of IT × period (28, 38, 18, 0, and 18% with IT-Yes and 45, 13, 0, 0, and 0% with IT-No in period 1, 2, 3, 4, and 5, respectively; SE = 4.9), IT × FT (5, 8, 15, 33, and 40% with IT-Yes and 5, 3, 18, 23, and 10% with IT-No for LowHigh, LowMed, Low, Med, and High, respectively; SE = 4.9), and IT × breed (8 and 32% with IT-Yes and 15 and 8% with IT-No for B and S, respectively; SE = 3.8). In the second study, 80 B and 75 S wethers and doelings were used to investigate effects of preliminary treatments (PT) on behavior when later exposed to different FT. Breeds were divided into two sets, each with five groups consisting of three or four animals and use of the same FT. The PT were imposed in five weekly and sequential exposures to evaluation pens: a common treatment for one set of each breed with moderate exposure to electric fence strands (BC and SC); mild exposure for the other set of B (BU); and greater exposure for the other set of S (SU). BU was designed to increase and SU to decrease later interaction with fence strands and pen exit relative to BC and SC, respectively. Each group was thereafter exposed to one FT for 1 h in period 1 and 7 wk later in period 2. Set (BC, BU, SC, and SU) affected (P < 0.05) pen exit (21, 52, 57, and 8%; SE = 7.0), receipt of a shock (19, 30, 7, and 4%; SE = 4.8), and pen exit with a shock (6, 14, 6, and 2%, respectively; SE = 2.8). Period affected (P < 0.01) the percentage of animals exiting with shock (13 and 1%; SE = 2.0) but not the percentage exiting. In conclusion, exposing goats to barbed wire fence without electric strands between measurement periods was not sufficient to eliminate differences among periods of a Latin square design. Use of the same PT for B and S resulted in different behavior when later exposed to FT. The BU PT affected pen exit as anticipated; however, SU caused animals to be highly reluctant to exit and was not suitable for use.